Phlox paniculata (perennial phlox) is originally from North America and is a widely used border plant with many different cultivars available. Reaching nearly 1m Phlox paniculata is a summer flowering perennial with flowers varying from white through to purple. The blue flowering Phlox paniculata Blue Paradise is an excellent variety, the white flowering P. paniculata ‘alba’ is always popular as is the pink flowering ‘Satin Veil’. pretty, large pink flowers. Try growing in a well drained humus rich soil, once established they are fairly tolerant of dry conditions but will benefit from watering during dry spells, grow in full sun with some mulch to provide a cooler root run. Fertilize with a slow release all purpose fertiliser in spring and an occasional application of seaweed or fish based liquid fertiliser during late spring to early summer. 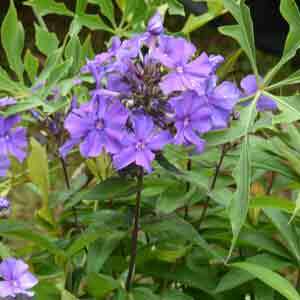 Phlox paniculata can be cut back when foliage dies off and clumps can be divided in autumn or early spring at first sign of new growth. Phlox paniculata is widely used as a border plant, lots of hybrids and cultivars are available for sale including the pink flowering ‘Star Fire’, ‘Satin Veil’, the fragrant ‘Blue Evening’ and darker pink ‘Morgerote’.